On Scene: On Duty with Benn, Firefighter. On Duty with Benn, Firefighter. On Duty are posts in which we highlight employees of TheFireStore who are not only committed to serving our customers throughout the workday, but also spend their free time serving in the industry they love. What is your job at TheFireStore and what does it entail? Quoting and preparing bids for federal fire, police and military organizations. I have frequent contact with representatives of these organizations. I suggest products and answer their question about the goods they are looking to purchase. In what line of service are you and for how long have you been serving? I have been in the fire service for 27 years, I started as a Junior Fireman when I was 16 with the Penn Wynne Fire Company in Lower Merion Township. 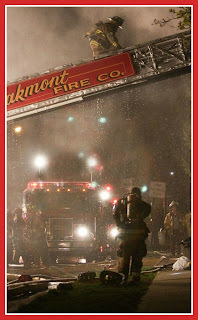 I am also an active fireman in the Brookline Fire Company in Delaware County. What do you love most about being a Firefighter? First and foremost I enjoy serving my community. I also enjoy the camaraderie and the brotherhood of the fire service. I have met many outstanding people and have maintained friendship through the fire service. My fire company works with special needs adults, I am always amazed at their excitement in seeing the fire equipment up close. Do you enjoy working in the fire service in both your professional and personal life? Why? I do because firefighting is one of my passions and I am lucky to be able to work my passion into my career. How have you felt your experience has helped you better aid our customers? I feel my fire service experience has helped me tremendously because I use the equipment I sell. When customers have questions I am usually able to answer them based on my own experiences.